The BlackBerry 8830 World Edition smartphone--the first CDMA BlackBerry smartphone capable of roaming globally on GSM/GPRS networks--is the stylish way to get things done. The 8830 is ideal for international travel, as it gives you full mobile voice and data coverage all over the world without having to change smartphones, phone numbers, or e-mail addresses. And that's just the beginning, as the 8830 also offers such standard functions as e-mail support, a built-in organizer, Web browsing, and instant messaging, as well as more advanced features like GPS support, access to the BlackBerry Maps service, a media player for your video clips and music, and expandable memory to ensure you have enough room for all your media files. The special World-Edition 8830 smartphone is ideal for international travel. The BlackBerry 8830 isn't big, but it's also not quite as compact as some of BlackBerry's other recent offerings, such as the Pearl. 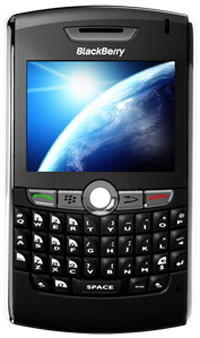 One of the main reasons is that BlackBerry added a full QWERTY keyboard to the 8830, letting you easily type e-mails and text messages without having to peck the same key several times to input each letter. 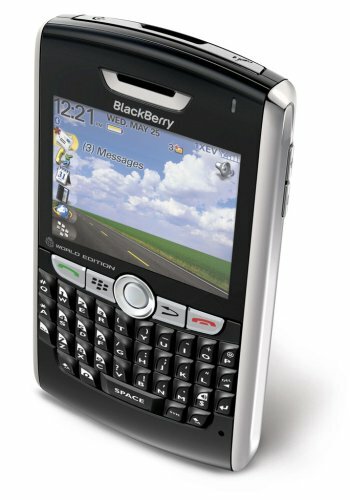 The venerable BlackBerry trackwheel, meanwhile, has been replaced on this model with an innovative four-way trackball placed below the screen. And users will love the dedicated Send, End, and Mute keys, along with the user-definable convenience keys. The full QWERTY keyboard makes it easy to type e-mails and text messages. All the calling capabilities folks have come to expect in a wireless phone are present in the BlackBerry 8830. The handset's speakerphone makes it easy to use the device hands-free, or if you prefer, you can use a wireless headset via the phone's built-in Bluetooth capability. The phone also offers a vibrating alert, a speed dial, and a contacts list/address book that's limited only by the unit's 64 MB of internal memory, which is expandable through the microSD card slot. And thanks to the phone's speaker-independent voice dialing function, you can call contacts with the sound of your voice. No prior voice training is required; simply say a contact's name and the phone will dial the number. 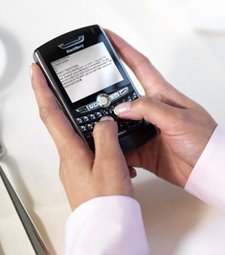 The 8830 offers the legendary BlackBerry e-mail experience. With BlackBerry service plans from Sprint, you can receive e-mails instantaneously from up to 10 e-mail accounts (personal and enterprise). BlackBerry's push technology, meanwhile, makes it easier than ever to receive your e-mails. BlackBerry devices are designed to remain on and stay continuously connected to your wireless network. As a result, you don't have to retrieve your e-mails manually, but instead are discreetly notified by the 8830 each time a new e-mail arrives. The unit also offers built-in support for viewing e-mail attachments in Word, Excel, PowerPoint, WordPerfect, and PDF formats. Plus, the phone's Multimedia Messaging Service (MMS) support lets you combine text and images within a single message, making it easy to caption photos and make amusing comments. As with most smartphones, the 8830 lets you access the Internet from the palm of your hand, with an integrated Web browser, up-do-date stock quotes, news readers, weather reports, and more--all at fast speeds thanks to support for Sprint's EV-DO high-speed data network. You can also use the 8830 as a wireless modem for your laptop or PC, letting you enjoy Internet access anywhere within the network's range. The 8830 also offers a number of Sprint-specific features when combined with the right service plan, including the ability to stream music to your phone through Sprint's Music Choice service. You can select from pop, rock, hip-hop, and R&B, plus enjoy access to exclusive video clips, performances, and artist interviews. Add in a built-in media player--which handles both real-time streaming video and audio at broadband-like speeds--and you have a terrific phone for multimedia fans. The media player supports MP3, MIDI, AMR-NB, AAC, AAC+, eAAC+, and WMA audio formats and MPEG-4 and WMV video formats. For larger corporate and government organizations, the BlackBerry 8830 works with BlackBerry Enterprise Servers to provide users and IT managers with a host of additional features. Among the options are secure access to Internet- and intranet-based applications, single mailbox integration, wireless synchronization with corporate PIM tools, and remote address book lookup. And unlike with traditional mobile phones, the 8830 series incorporates advanced security features to satisfy strict IT requirements. Other enterprise features include the ability to receive proactive wireless notifications and alerts from executive reporting systems, the capacity to wirelessly access service histories and product bullets, and the ability to initiate a spontaneous conference call using the built-in speakerphone. The BlackBerry 8830 measures 2.6 by 4.49 by 0.55 inches (W x H x D), weighs 4.6 ounces, and includes a lithium cell battery that lasts for up to 220 minutes of talk time and nine days of standby time on the CDMA network. The phone, which is stereo headset capable, also comes with a one-year warranty. BlackBerry 8830 phone, USB cable, wall charger, user's manual. We LOVE the Blackberry 8830, especially for its multitudinous settings. It does have a few issues, but compared to the previous 10 different mobile phones we've had over the years, we are very happy with this model. This USA model is unique and we also appreciate its World Wide International feature. We have no need for a camera or video phone because we use separate devices for that purpose. It does have a music feature, but we rarely use it because cell phone sound quality does not compare to using an iPod with portable Bose speaker. Since nothing in life rarely stays the same, we expect the future - newer 8830 model to improve. Hence, this design is only a beginning to even better devices in phone evolution. The 8830 Blackberry is the slimmest to date with the most stable os in the business. The email capablities are legendary. The screen has improved a 1000%. And now that Sprint has a 3G network its even faster. Heres what I don't like: There's not a camera. But I dont know what everyone is talking about I get my pictures fine. Maybe because the os has gotten an upgrade now. Being a designer I have to have a better camera than a pictures froma camera phone. No biggie. No wifi...to compete with verizon and apple we implore you, add it. I switched from the Verizon Q to the BBerry 8830 because I wanted the push email (which is probably protected by some absurd patent) and because the OS is supposed to be more stable. Now, I want my good old Q back. Overall, I had some minor complaints and one very major complaint: the bluetooth has a very weak signal, especially for the person on the other end. I pretty much have to hold the phone 1 ft from my head. Sure sometimes it will seem to work 10' away, but I can't get a clear signal with the phone in my pocket or in the passenger seat of the car. I tried two different H700 headsets and a Plantronics Voyager 510 and even returned my original 8830 to Verizon for a new phone. So if you like the handsfree option, avoid this phone at all costs. Otherwise, it's not bad. We're loyal BB users and have been for some time and from every carrier from the Nextel 7290 ( a dimwit's Mensa application is brighter than that old screen) to a GSM 8700 model. Lighter than an 8700, brighter, louder, clearer and much faster bandwidth. The thumbwheel used for scrolling and "Enter/Select" is replaced with the center Pearl / thumball, trackball whatever you want to call it. You scroll it to move the cursor and press it in to execute the command/Enter. The other thumb button below the thumbwheel (thumb if you're right handed, if your left handed then you have been outlawed by RIMM and the Canadian Govt) is also gone and has been split into two more front buttons with the back/return feature replaced by the boomerang arrow which is between the Red Call Cancel and joystick. The Cancel/Escape feature has been moved to the other new front button between the Green Call and center trackball. Thumbwheel has been replaced by a rocker switch more closer to the rocker switch on the left side of a Motorola Razr on and is also used for volume control. UNLIKE THE 8700, THE TWO NEW FRONT BUTTONS CAN'T BE REASSIGNED OR AT LEAST CAN'T BE REASSIGNED OUT OF THE BOX, IF THERE IS AN ADD ON APP TO CONFIGURE THOSE TWO NEW FRONT BUTTONS THAN PLEASE SHARE. The left side convenience button is manageable and default setting is for voice dial. The 8800 series keyboard is a dramatic difference from the 8700 because unlike the 8700 and most BB models before it, the keys aren't separated by blank space and this made it harder to type. Prior BB's (except Pearls) have segregated keys and are forgiving even if you have overly large finger tips since each key is distinctly separated by blank space. The 8800 is more like a tight laptop keyboard where all keys are buttressing, now they are beveled on the edges but it took just a few minutes for us to become accustomed to it. If you don't like buttressed keys then definitely spend ample time evaluating the keyboard in the store before committing to the 8800. The screen is a scratch magnet !!! Even with gingerly treatment we've already blemished our screens and this will irk those who want to keep their phone perfect especially for resale value. BUT, a standard piece of clear packing tape will fit perfectly across the face w/o covering up the ear piece or intruding on the center button. Then take a sharp razor and carefully slice between the silver and black face plate to trim off the tape. Do this as a permanent measure or temporarily until you can find the perfect case and screen protector. IF YOU'RE WORRIED ABOUT TAPE RESIDUE REST ASSURED SOME ISOPROPYL ALCOHOL 70% OR GREATER SOAKED ONTO A PAPER TOWEL REMOVES ANY TAPE RESIDUE AFTER REMOVING THE CLEAR TAPE AND WILL DO SO WITHOUT MARRING THE SURFACE. That center pearl replaces the thumbwheel, this was the hardest adoption point for us. TIP: Set the sensitivity of the center joystick ball to the lowest level of 20 until you get used to it then start upgrading the sensitivity. After a few days, we noticed many of our employees adapted to the pearl controller and the most challenged on our staff were comfortable with it after a week of usage. We've read the other reviews which consistently describe the phones mic as less than standard and we mentioned this to the Sprint Rep. They described this as known issue and said that RIMM has addressed the problem. Whether or not this is true, or if our friends and associates are just intolerant -we haven't experienced the issue in several hundred calls so the Sprint Reps statement seems to have some credence. Regarding the network , I tend to describe and compare cellular networks with a grain of salt since each network has better coverage in different geographical areas, but ours are performing well in most major and secondary urban markets. The bandwidth is superb, this is an EVDO-Rev 0 phone instead of the faster EVDO-Rev A. Most people don't require the faster network since most people don't use cell phones for full web browsing instead of a traditional computer browser. We've used it to tether data and we're getting consistent 300kbs throughput in the urban supported broadband areas, just like other data lines and cellular calls the bandwidth will slow down during peak usage such as rush hour where two or more highways cross over since the network tries to balance the network and give everyone a chance to use their phone. Data users are impacted by decreased bandwidth and will eventually be dropped if the network becomes extremely congested and you've been tethering longer than others. TIP / Avoid using the Sprint Connection Manager when tethered and just create a new Dial Up Networking Connection using the native Windows function and set the tether as the "modem" and the phone number as #777. No user ID or password and you'll have less dropped data calls because the Sprint Connection Manager will transmit usage data to the Sprint network and they drop data calls based on profiles. If you don't believe this, just start a data call and fire up a packet sniffer like WireShark or TCPView.exe with logging and you'll see odd UDP packets to a Sprint server even if you've disabled all the applications which would normally transmit data. We didn't see these packets when using the #777 option and our calls lasted longer w/o dropping. The GPS is superb ! You have to download the software and agree to some rates but Sprint's current $99.99 all you can eat package covers it so just accept the agreements and start using it. THE GPS works inside and is extremely accurate for locating your current position. The included case is the nicest case we've ever seen included with a cell phone, it is a leather or high quality leather imitation which is well cushioned and has a decent clip. The flap is a magnetic one and this is comparable to any premium executive model belt case. The GPS functions are two different applications which are independent of eachother, the TeleAtlas which downloads map data directly from Google Maps with an internal GPS antenna so it taks signal indoors like a TomTom and other next gen GPS recievers. It can search for business by name and provide address and telephone info or street addresses then select the "Navigate To" feature and the BB will begin routing you to the destination. The TeleAtlas app doesn't offers map only data without the Terrain or Satellite mode which displays the actual trees and roads but you can download this utility directly from Google. The TeleAtlas application seems to be without a voice prompt feature but the TeleNav subscription service from Sprint offers this. TeleNav is another excellent GPS application offering address and business lookup but also can be used to quickly select points of contact from your address book then just selecting the record as your destination. It has more features such as "Avoid Traffic" that tries to aggregate known data such as rush hour and real time traffic info (if available in your area) to divert you from accident scenes and road construction. We tested the GPS against a Garmin eMap and NavMan PiN PocketPC version and not exactly equal since the other two require line of sight to the sky for signal / the BlackBerry displayed accurate locational, current speed and time and distance to go data to every destination. The most notable missing feature from both BlackBerry GPS applications was an "avoid road" feature, the basic capability to click a road on a GPS map and force the unit and navigation to avoid the road at all costs or for a certain distance is very helpful when taking a route that is blocked by road construction or trying to drive somewhere on a Sunday morning when the streets are closed because of marathon. IF THIS FEATURE EXISTS, please comment on our review and share the details. Subscription GPS is slowly gaining predominance as the busines model instead of buying a unit then downloading sporadic updates like most popular units and the advantages of regular data updates are clear and compelling. At the time of this writing, Sprint is offering a $99 "all you can eat" rate plan and the normal $12.99 monthly TeleNav service is included. A point of hesitance for using phone GPS is the smaller screens, although the BB is smallest of the three we've ever used, it is just as vivid and brighter and crisp or better than all we've ever seen. This phone is great; it handles all of my e-mail addresses seamlessly, my address book is large, custom phone tunes, easy to use media player with large access via card, etc.. etc..
Best of all, world edition UNLOCKED. Travel around, buy a SIM, throw it in--I can go anywhere. Unlike other carriers 8830's which are locked to Vodaphone or another foreign company. This also has a wide array of third-party applications which work well, some of which are actually enjoyable. Albeit, it was a learning curve for me as this was my first "smart phone". I won't go into all the details of what it took to get this phone to fully function correctly (some me, some Sprint). Depending upon whom I spoke to of course I received what I would rate overall as below average customer service. I've also had to replace the phone after 9 months use due to the power input breaking off ... They did replace the phone for $55 (I didn't purchase the optional insurance), remember to back-up your device! Luckily, I had just a week or so ago. Restore worked perfectly. Blackberry network was down once since I've had it, I didn't occur any major interruption. I sync three email accounts, two personal and one work, this I think is one of the devices (Blackberry) strong points, configuration and delivery is seemless. Also, attachments, pdfs, ms office files, adobe... display easily and quickly. When I got this phone I was excited. It was the clearest reception I'd ever had and it had internet and could be used as a modem, not to mention all kinds of cool stuff can be downloaded to it. Problem is not everything works. While plugging my laptop into the blackberry is usually reliable, accesssing the internet on the blackberry itself is often a problem. I just canceled my internet because it's down half the time (as is the GPS). It also likes to randommly go into voice command sometimes. This is a "smart" phone? First of all, let me preface this by saying I LOVE my phone. The reception is usually stellar. It's far sleeker than other models of its kind, especially the original bulky BlackBerry - you feel like you're carrying around an actual phone rather than a computer. I can use it overseas, and as a travel writer, this is vital. I've never had another American phone that I could enable when I left and disable when I came back into the country - most phones don't have that option. Before, I've always been forced to buy a foreign phone and SIM card each time I traveled, but it's so nice knowing I'll be able to get on the Internet whenever I need in nearly any country I'm in. For a PDA, the battery life is amazing. I use my phone a fair amount, and I usually only charge it ever third night. Coming from the Motorola Q, which would die halfway through the morning every day, this is an awesome asset. Also, the case that it comes with has some sort of function that turns the LCD off automatically when you put it in there and saves battery life. It's compatible with PCs and Macs, so you can upload your pictures, videos and music. There's no longer a need to carry around a wrinkled photo of your toddler in your wallet, when you can automatically bring it up on your phone. -If you do a lot of talking outside of your own home, this is NOT the phone for you. The 8830 picks up every bit of background noise and often gives the person on the other line a severe headache. I tend to use this phone more for texting and Internet; however, when I'm phoning my mother and boyfriend while walking around New York, they always complain they can't hear a word of what I'm saying. I used to think this was just them being fussy, but then a friend got the same phone and when she called me on the way to work, it sounded like she was in a wind tunnel. I couldn't make out what she was saying at all. Other 8830 users have complained about the same thing. And there is no way to adjust the mic sensitivity. When I called BlackBerry's customer service, they acted all shock, like this was the first complaint of that kind they had gotten. But I'm 100% certain it's not. I've now had two different 8830s (first one was stolen) and each was just as bad. They said there is no way to adjust the mic sensitivity. If you generally just talk on your phone in a silent home or car, this shouldn't be a big issue. But if you're often in places with even the slightest background noise, it will be a problem. -This isn't a big issue, but there is no predictive text function. For someone who texts a lot, this is pretty annoying. However, to make up for that, the 8830 automatically punctuates and capitalizes for you, which is nice if you care at all about your texting grammar. It also has a spell-check function. -No camera. I didn't think this would be a problem, as I never used my old camera on my phone much, but when I receive picture messages, I have to look at them online. -You can just start typing a name and the number of whomever you are trying to reach will come up, which is nice, however if you then highlight the name, it automatically starts dialing, which is annoying, especially if you're just trying to look up a number. I often do this to send a message, and I have to quickly press end because it's already calling the contact. A minor annoyance but still. -It freezes an awful lot. Mostly, it seems, when I have just finished writing an insanely long e-mail and have yet to push send. Then I have to turn it off, wait for it to boot up again, etc. But I think this is how it is with all PDAs (or so I'm told). -The overseas function is often iffy. Before I went to Iceland and Germany last month, I called to make sure I could use it in both places. I was told that I could call and text from Iceland and not get on the Internet and use all functions from Germany (it varies by country). However, it turns out I couldn't send texts from either country, but I could receive them - both from people in the country and people from the US. I also could call and get on the Internet from both places, so I was a little baffled. It is expensive, though, at $1-$1.50 a minute, I believe, to talk and use the Internet, and $.50 a text. Know the rates before you go! I don't even want to see my phone bill from those three weeks! Have had the 8830 for about 2 weeks. So far, I have been happy with it. Took me a whilte to get used to the ball. My 8830 worked flawless here in the United States, but failed overseas. Several days before traveling overseas, I contacted Sprint International desk to have my phone provisioned for use in United Kingdom. Sprint International Customer Service hung up on me. I then went directly to Sprint store and supposedly activated the phone. When I got London, the phone did not operate on the GSM network. I contacted Sprint International desk from overseas and was greeted by a phone message that Sprint International was unavailable, please call back later. I called the Sprint International via their local phone number and got right through. The customer service agent stated my phone was not provisioned for overseas. The Sprint representative supposedly provisioned my phone and advised my account would now work overseas. When she performed that function, the phone sputtered and responded with a message, "App Error 205." The phone never worked again. Two weeks later, when I returned to the US, Sprint had to replace the Blackberry 8830 with a new one, but they did not provision my email, so my email did not work. - Occasional issues with syncing with yahoo account. Have had to call support three times due to some emails coming through but others not.